The firework season is upon us, with fireworks on sale from mid-October, with peak activity in the last week of October (Halloween) and the first week of November (Bonfire Night). Fireworks are fun for us, but not for most cats. Like all wild animals, cats associate loud noises with danger, and will be stressed and fearful. We all know how lightning-fast a cat's reflexes are, and the sudden loud noise and flash of fireworks can cause them to bolt for safety, but in their panic it could be in any direction. Displays tend to go on for a long time, and a cat can be totally terrified and disorientated by the time quiet returns. Some animal sanctuaries report a larger number of strays handed in, as a results of scared pets running away from home - more are hit by cars as they try to run from the noise. In other areas, fewer cats are found because people are not around outside so much in the dark, and don't notice a lost stray in need of help. The best thing you can do is to keep your cat indoors after sunset at this time of year, with the curtains drawn and the TV on. Even if you don't normally use a litter tray indoors, this is a time when it is worth doing so. Remember to keep the windows shut and the cat flap locked! Don’t be surprised if your cat stays in a dark hidey-hole where he feels safe when fireworks are about, and don't try to tempt or grab him out of his sanctuary - it will just stress him more. Usually he will come out when the noises are over. He can hear a lot better than we can, so we may think there are no fireworks going on, but he can still hear them further away, so wait for him to emerge of his own accord. If he stays hidden for a long time, make sure there will be food and water available when he does come out. If your cat doesn't hide, she may want extra cuddles and reassurance. Don't overreact if your pet shows signs of fear, as this may make them worse. Stay calm and behave normally. Before letting your cat out in the morning, or unlocking the cat flap, check your garden for firework debris carefully. 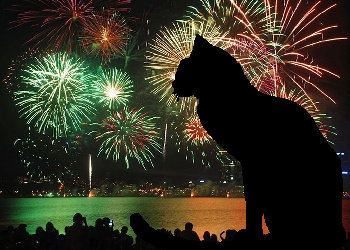 Fireworks can stay hot enough to burn a cat's mouth for a long time, and a lot rely on heavy metals for their colour effects; these can be toxic if your cat licks them. Examples of the metals used are mercury, antimony, barium, strontium and phosphorus, all of which are very poisonous. If, for some reason, you do have to take your cat outside, such as if you have to travel somewhere, make sure they are safely in a cat carrier. The most important precaution you can take is to have your cat microchipped so that you stand a better of chance of being reunited if a door is left ajar and your cat slips out. What about stray and feral cats at firework time? If you feel that you can, please consider leaving a shed door open overnight so they have somewhere to take shelter. Be aware that in some areas, fireworks come into the hands of children who treat them like toys, and set them off at any time of day, with no consideration for safety. If you live in an area where groups of children congregate to play in the street, it may be best to keep your cat indoors. Better to be safe than sorry. Of course some cats really enjoy sitting in a window watching the fireworks! If this is your cat, then have a great time together this firework season!